Fiat 500- pretty in pink but perhaps all proposition? 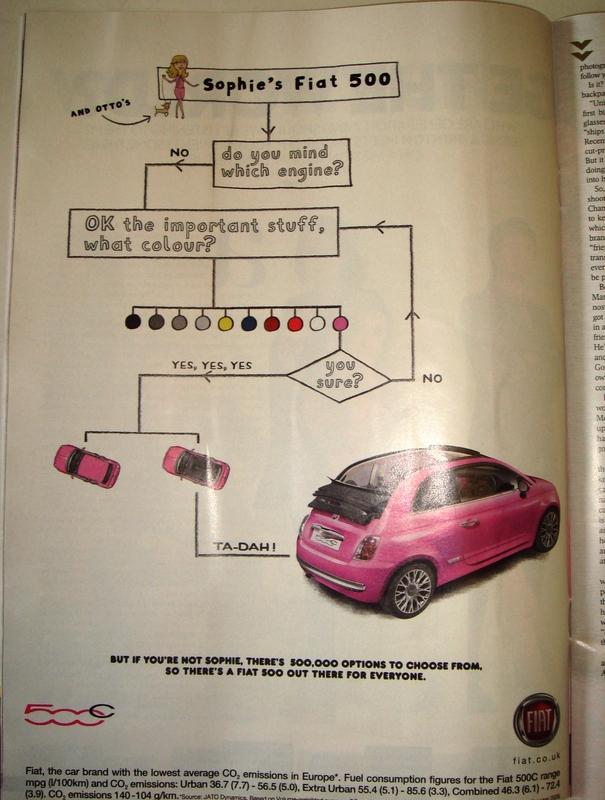 I saw this ad for the Fiat500 in yesterday’s paper and something immediately felt…not quite right. I pondered and realised that it felt like the campaign went straight from Planning to Artwork, almost bypassing the Creative Department entirely. The bottom copy line there’s a Fiat 500 out there for everyone feels like it has been lifted straight from the ‘proposition’ box on the creative brief and the decision tree creative isn’t exactly a new approach. It’s the kind of thing that would come to mind when as a Planner you’re asking yourself ‘could I write an ad from this brief?’ not the finished work you hope will result from it. It also feels a bit niche for its media placement – The Sunday Times Style magazine appeals to lots of different potential audiences for a stylish supermini, so perhaps limiting it to Legally Blonde types looking for a pink convertible is a bit short-sighted too. In its defence, there might be half a dozen other executions on the way, but this is the only one I’ve seen so far. You’d have to be fairly engaged with this ad to get as far as reading ‘But if you’re not Sophie…’. If they were going to go down this route and with only one execution, I’d have tweaked the decision tree to be more complex, resulting in very different outcomes for lots of different types of car drivers to illustrate the ‘500,000 options to choose from’. I’m not saying this ad is wrong or bad, but (for me) its school report would read ‘could try harder’. Next Post why do brides say ‘I Do’ to the strapless meringue? Who are these people employing? The terrible cliche that women care more about the colour than the dynamics. The “well I’m sure you’re not as bad as that” talking down to purchasers. The use of choice instead of any actual benefits. The packshot idea of creativity. This is why buyers are deserting advertising and turning to social media for purchase advice. So stop complaining ad agencies. you’ve done it to yourselves.